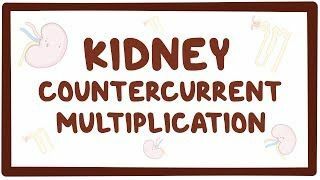 Osmosis: Kidney countercurrent multiplication. (2019, April 20). Retrieved from (https://www.osmosis.org/learn/Kidney_countercurrent_multiplication). One of the main functions of the kidneys is to keep the solute load of body fluids constant by regulating urine concentration and volume. The kidneys accomplish this task using countercurrent mechanisms. The countercurrent multiplication system relies on the interaction between the flow of filtrate through the ascending and descending limbs of the long nephron loops of the juxtamedullary nephrons. It depends on actively transporting solutes out of the ascending limb of the loop of Henle. The countercurrent multiplier allows the nephron to maintain the medullary osmotic gradient in order to vary the urine concentration dramatically. Step two in the countercurrent multiplication system is the flow of fluid from the proximal tubule into the of the loop of Henle. The stuff that gets filtered into the tubule is called the filtrate, and the rest of it leaves the glomerulus through the efferent arteriole. Interestingly, the blood that leaves these glomeruli does not enter into venules. Instead the efferent arterioles divide into capillaries a second time. These peritubular capillaries then reunite and at that point the blood enters venules and eventually drains back into the venous system. Now, The renal tubule is a structure with several segments: the proximal convoluted tubule, the U- shaped loop of Henle with a descending and ascending limb and the distal convoluted tubule, which winds and twists back up again, before emptying into the collecting duct, which collects the final urine. Now, zooming in on this nephron’s tubule, each one’si lined by brush border cells which have two surfaces. One is the apical surface which faces the tubular lumen and is lined with microvilli, which are tiny little projections that increase the cell’s surface area to help with solute reabsorption. The urine osmolarity is the concentration of urine, and is measured in Osmoles per liter, which is the solute particles that exist in a liter of urine. To concentrate urine, or increase its osmolarity, nephrons rely on the corticopapillary gradient, which is a concentration gradient that spans from the cortex to the papilla which is the innermost tip of the medulla. In other words there are a lot of solutes in the interstitium with more solutes down here then up here. So as a tubule dives deeper down into the medulla, the surrounding interstitium gets more and more hypertonic relative to the lumen of the tubule, and that drives more and more water out of the tubule, the deeper it goes. So you can see how important the corticopapillary gradient is - it prevents us from unnecessarily losing water - like a water recycling mechanism. Establishing the corticopapillary gradient takes a lot of work - specifically, it relies on two key mechanisms - urea recycling which helps bring urea into the interstitium and countercurrent multiplication which helps bring electrolytes into the interstitium. Let’s focus on countercurrent multiplication, and let’s start with blood which is coming into the nephron with an osmolarity of 300 mOsm/L, and we’ll use these purple boxes to indicate the osmolarity of the blood. As it passes through the proximal tubule, there is almost no osmolarity change so it remains at 300 mOsm/L as it enters the loop of Henle. We’re going to focus mostly on the loop of Henle so let’s zoom in a bit to show the ascending and descending limbs. Now to start let’s just assume that everything is 300 mOsm/L, both in the tubule and in the interstitium. The first step of countercurrent multiplication is called single effect, and it involves the ascending limb so let’s hop over to that side. Tubule cells along the ascending limb have Na+K+2Cl- cotransporters on the apical surface, and they shuttle one sodium into the cell down its concentration gradient, and that powers the movement of one potassium and two chlorides into the cell as well. On the basolateral surface of the tubule cell, a Na/K ATPase uses ATP to pump three sodium ions into the interstitial fluid in exchange for letting two potassium ions into the cell. This helps to maintain the low sodium concentration inside the cell. Finally, both chloride and potassium move from the cell into the interstitial fluid as well, passively through their own channels down their concentration gradients. So essentially here you have solutes being transported out into the interstitial space, but since we’re in the ascending limb, it’s impermeable to water, so the tubular fluid becomes more dilute as solutes are continuously transported out, going from 300 mOsm/L to 200 mOsm/L. Now the volume in the tubular fluid is much lower than the volume in the interstitium, but if this process happens over and over, then the interstitial fluid will become more concentrated, and eventually rise from 300 mOsm/L to 400 mOsm/L. Now in the descending limb, the tubular fluid boxes have an osmolarity of 300 mOsm/L, but unlike the ascending limb, the descending limb is permeable to water and solutes, so that means that the tubule will equilibrate with the interstitium. By the process of osmosis - water will move from the tubule to the interstitium, and solutes will diffuse in the other direction - from the interstitium into the tubule. Once equilibrium is reached, osmolarity in the descending limb will go from 300 mOsm/L to 400 mOsm/L.